A man was airlifted to hospital after being stabbed in broad daylight. 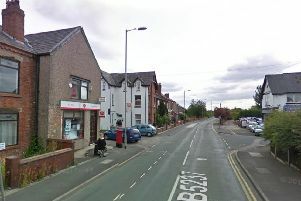 Police were called at 2.15pm on Friday, July 20 to reports a man had been stabbed on Carfield in Skelmersdale. The man, who is in his 30s, suffered a stab wound to his shoulder and was airlifted to hospital for treatment. Det Con Andy Gill, of Skelmersdale police, said: “This has happened in broad daylight and has caused serious injury to the victim. A 43-year-old man from Skelmersdale has been arrested on suspicion of section 18 assault and has been released on bail until August 17. Anyone with information is asked to call Skelmersdale police on 01695 566180 or 101, quoting log 750 of July 20.